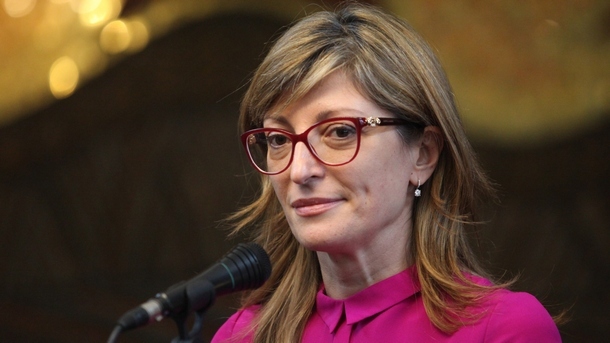 Bulgarian Foreign Minister Ekaterina Zaharieva announced that the Bulgarian Parliament may ratify Macedonia’s NATO accession protocol as early as next week. The Greek Parliament ratified the protocol on Friday evening, as provided among the few Greek obligations in the Prespa treaty. It is in Bulgaria’s interest that Macedonia becomes our ally in NATO. This includes having Macedonia in the European Union, Zaharieva said. She called on the Parliament to ensure that Bulgaria is among the first countries that ratifies the protocol. Bulgaria joined Greece in blocking Macedonia’s EU and NATO accession, and demanded the signing of a treaty which includes provisions that will allow Bulgaria to demand changes in Macedonian history books, school books and overall public discourse. Bulgaria does not recognize the existence of the Macedonian nation and language as separate from the Bulgarian and these positions reflect in the on-going negotiations about the context given to historic figures and events. Siljanovska: With the agreement we will have to erase from history books that the Macedonians fought in the civil war in Greece!